For years Matt Walsh has been an outspoken conservative commentator and blogger on politics and abortion. He has amassed an ardent audience through his multiple media portals. I’ve enjoyed reading many of his opinions. With the release of his YouTube video, Why I am Not A Young Earth Creationist, this past week, he took a bold step into an area of theology for which he appears to be completely unprepared. Biblical creationists take every single thing in the bible completely literally. Poetry, parables, exaggerations, symbolism are all held the same as history, doctrine and the words of Jesus. This is a ridiculous view. Biblical creationists take the genre into consideration when reading God’s revealed word. Walsh’s opening point is very polemic and unhelpful to the conversation. Genesis is written as history. The author’s intent was to to convey to his readers that the events in Genesis are part of the history of God’s interactions with humanity and specifically the origins of the Hebrew people. The rest of the old testament and dozens of times in the new testament, Genesis is quoted as having actually happened. Genesis regarded by Moses, the other old testament authors and the new testament authors as history. Should Walsh want to believe that part of Genesis was metaphor and part history, where does this switch happen? Biblical creationists demand that Genesis be a scientific encyclopedia that explains all fields of science in the greatest depth. Again, this polemic misrepresentation adds nothing to the discussion. Nothing in scripture is intended to be a scientific treatise, but where scripture covers something scientific, it’s never incorrect. The creation story in Genesis 1 and 2 is not concerned with teaching humanity about profound scientific principles. It is God’s revelation of his miraculous acts of creation. Since creation was supernatural acts involving his supreme power, why do old earthers, like Walsh, expect naturalistic explanations for these miracles but not the other miracles in the Bible? Virgin birth? Resurrection from the dead? These things are scientifically impossible. Why do old earthers specifically segregate the miracle of creation as impossible? Biblical creationists agree that the Hebrew word “yom” can be translated in many ways. The key to understanding what it means in each passage, and specifically Genesis 1 is called exegesis. Look at the context and where scripture talks about this event in other places to see what the word means here. Each of the days of Genesis 1 are denoted with an ordinal (THE 1st day, THE 2nd day, THE 3rd day…), and each of the days is bounded by evening and morning. Looking at Exodus 20 (which is a passage that NO ONE says is poetry), God says your weeks should be like my creation week. “Six days you shall labor and do all your work but the seventh day is a Sabbath to the LORD your God…For in 6 days the LORD made the heavens and the earth, the sea, and all that is in them, but he rested on the seventh day.” So, by exegesis we have 100% verification that God intended his people to work for six 24-hour days and rest on one 24 hour day…just like He did during the creation week. So if old earthers want to change the definition of a day in this context they have to overcome the direct command from God about the course of a week and the ordinals and familiar boundaries of evening/morning. Biblical creationists hate science and they think that all scientists in all fields of science are lying about their conclusions of long ages. Again, more straw-man arguments that are not true. Most branches of science were started and developed by biblical creationists. There are axioms and assumptions in all scientific research. Biblical creationists forsake the naturalistic assumptions that the modern paradigm relies upon for their old earthism. If Walsh wants to accommodate old earth cosmology because the vast majority of scientists believe it, he is bound to accept the biological origins of humanity as well, which is also untenable from a biblical perspective. But the more you watch his video, he is not interested in rational discussion. He is clearly not trying to be persuasive but is instead purposefully mischaracterizing those with whom he disagrees as morons. Walsh gets his arguments mixed up at one point by saying there are days prior to there being an earth…except the first sentence in the Bible says that God created the earth at the beginning. He then misunderstands the definition of a day saying that there must be a light source or days mean nothing. This is not true. The definition of a day is 1 rotation of the earth on its axis. No light source necessary. But for his old earth position, he has a HUGE shortcoming in his foundations since a year is defined as the time is takes the earth to revolve around the sun. What are the units of time prior to the sun and earth coalescing from primordial space dust and how is that calibrated? They would say it’s 9 billion years, but what is a year prior to the calibration of a year existing? Watching his video once was bad enough, but going back through it again to highlight his misunderstandings is nearly unbearable. So, while there are more strawmen arguments and lazy analysis of biblical creation, it is sufficient to say that Walsh could use a serious re-adjustment of his perspective regarding God’s revelation in Genesis. Our understanding of science is based upon God’s revelation from the Bible; not the other way around. Sadly, the church in America has gotten a little too cozy with the government of the USA. There’s too much “rah-rah; kick ’em in the jaw!” when it comes to bombing Muslim extremists or assassinating Bin Laden. The church has been fine supporting and giving more power to the government. What will happen if when the government adds Christians to the terrorist bucket? Now, the SPLC is not the government, but the government has been using the SPLC’s lists of hate groups to build their strategies. The SPLC even added Dr. Ben Carson to their extremist list back in 2015. There is a strong desire by those in power and those with “the microphone” to marginalize Jesus and his Word. So let yourself be filled with righteousness, truth, the gospel, faith, salvation, and the Word of God. Remember that history is written by the victors and we know that the victory has already been won. So, it will be unpopular and it will get tougher to be a disciple of Jesus, but that should not dissuade us from being lights in a dark world. UPDATE: Now the courts are making it a standard practice to punish those who express quiet thanks to God in a public place. For the purpose of my class, I added “Covenant” between Confusion and Christ…I mean, for Heaven’s sake! That’s almost 2200 years of time that God was working with his chosen people in the form of the Covenant. So, Answers In Genesis SHOULD have included “Covenant” as one of their C’s, but maybe they were on a budget. It should be noted that I’m not getting any money from this endeavor, and I am giving credit for the general idea to AIG ministries. Ultimately, it is God who receives the glory and it is because of Him that we live and breath and have our being. All of the pictures in the slideshow are linked images and suitably credited. So, no lawsuits please! I’ve created Google Slide presentations that I will post here for people to keep up. Feel free to share the links or use the material to spread the Good News of God’s redemptive plan as revealed in his word! Here is a timeline that I constructed as supplemental material for the class. Enjoy! Who has seen Jurassic World? I’m anxious to see it as I was a huge fan of the original Jurassic Park from 1993. The idea is that scientists were able to clone dinosaurs from dino DNA that was retrieved from amber-trapped blood parasites. Great story, but it is built upon a foundation of irrationality. The dominant paradigm of billions of years of evolution acting on genetic code to form all terrestrial life from a single cell ancestor is completely at odds with the historical account of the Bible. It is said in this dominant paradigm of scientism that the dinosaurs died out 65 million years ago. The problem for this epic fairy tale is that the dates are wrong. The bards of this epic fantasy tell us that radioactive dating has proven that the fossil material recovered in archaeological digs is absolutely dated as older than 65 million years. The problem is that they have disregarded one of the Creationist’s best friend, Carbon-14 testing. This article shows how the story of evolution is coming apart. The CRSQ study authors tested seven dinosaur bones, including a Triceratops from Montana, hadrosaurids, a cartilaginous paddlefish, a bony fish, and fresh-looking wood and lizard bones from Permian layers in Canada and Oklahoma. 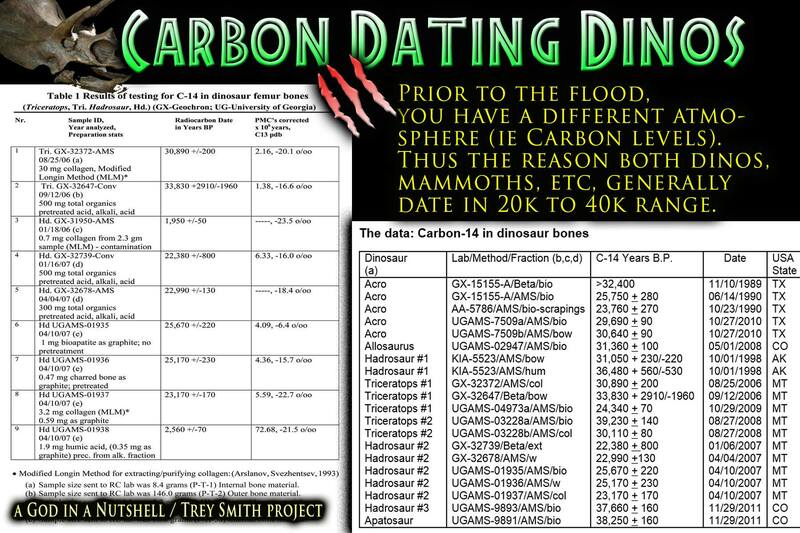 Five different commercial and academic laboratories detected carbon-14 in all the samples, whether from Cenozoic, Mesozoic, or Paleozoic source rocks. It’s a nightmare for the evolutionists. But all of these dates verify the historicity of the Bible. At every point, we find that God’s Word can be trusted. We find that since we can trust God about his revelation of history, we can trust Him in his prophecy about our future.